Do you get it? Varsity... jacket, and blue... jeans?! I know, I know. You don't have to mention how clever that was. Anyway... This time of year, that transitional time between winter and spring (when it's technically spring) is arguably my least favorite non-season of the year. I feel uninspired, I'm absolutely sick of everything in my closet and, I don't know if you know feel me on this, but figuring out what to wear for the temperatures between 37 and 53 degrees for weeks on end is not easy. 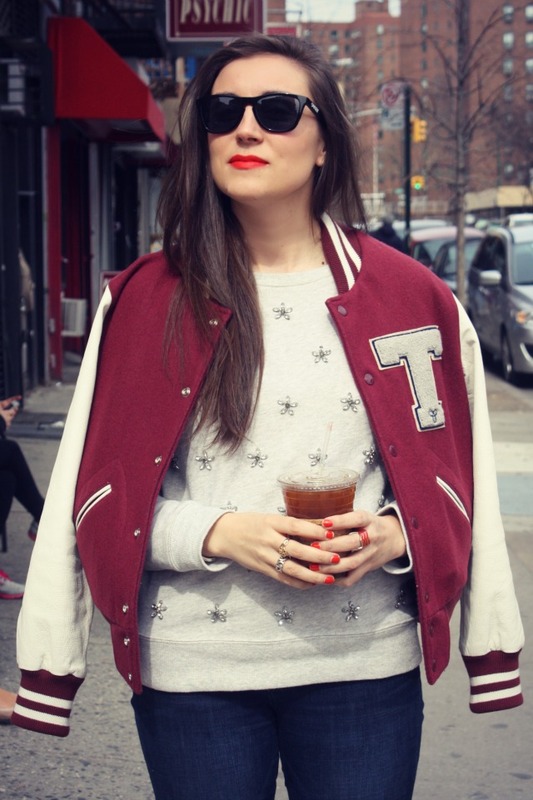 And so, I turn to can't-miss classics like a crew neck sweatshirt and softer-than-soft jeans in a clean, dark wash.
As you might be able to guess, I still can't stop wearing my varsity jacket, which happens to be perfect for this time of year. Under it, this sweet (and very budget-friendly) embellished sweatshirt from Forever 21 I picked up a few weeks ago. It's not often that you'll find me in heels during daylight hours, but with these leg-elongating flares from Paige Denim, they're a must. Plus, I think they really help complete that high school throwback feeling I get whenever I wear this jacket. Also, can we just have a moment for the glorious return of iced coffee season? While yes, we're still in that frustrating, awful transition-to-the-transition time, we can sip on an icy cold caffeinated beverage and dream of warmer days to come. I've been having the same problem recently. What do you wear when you're sick of your winter clothes, and the weather is 35 one day at 70 two days later?! Here's to hoping spring has finally sprung! This outfit is perfect for the transition BTW.